Adjust the seat. See “Seats” in this section. The retractor is designed to lock during a sudden stop or on impact. 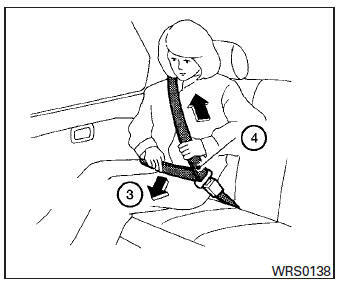 A slow pulling motion permits the seat belt to move, and allows you some freedom of movement in the seat. The Emergency Locking Retractor (ELR) mode allows the seat belt to extend and retract to allow the driver and passengers some freedom of movement in the seat. The ELR locks the seat belt when the vehicle slows down rapidly or during certain impacts. 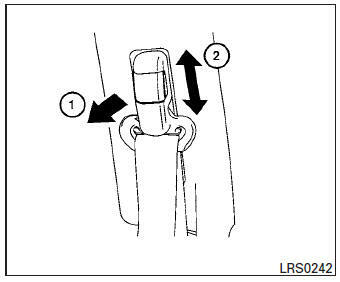 The Automatic Locking Retractor (ALR) mode (child restraint mode) locks the seat belt for child restraint installation. 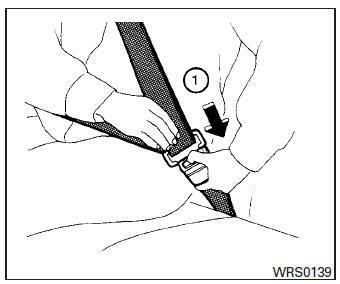 When the ALR mode is activated, the seat belt cannot be extended again until the seat belt tongue is detached from the buckle and fully retracted. The seat belt returns to the ELR mode after the seat belt fully retracts. See “Child restraints” in this section for more information. 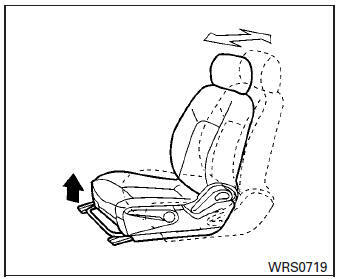 It can also change the operation of the front passenger air bag. See “Supplemental air bag warning light” in this section. When the seat belt is pulled quickly from the retractor. When the vehicle slows down rapidly. The shoulder belt anchor height should be adjusted to the position best for you. 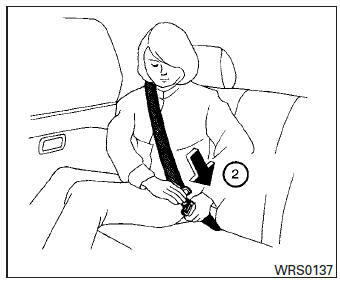 See “Precautions on seat belt usage” in this section. To adjust, pull out the adjustment button 1 and move the shoulder belt anchor to the desired position 2 , so the belt passes over the center of the shoulder. The belt should be away from your face and neck, but not falling off your shoulder. Release the adjustment button to lock the shoulder belt anchor into position.